At present, he heads the Pathology and Electron Microscopy Division. As a Pathologist and Toxicologist, he collaborates with other colleagues from other Divisions and has undertaken research projects of his own Division also. His areas of interest are (1) Nutrition and Cancer interaction (2) Nutrition & Toxicology. Recently he was selected for the “Normal E Borlaug International Agricultural Science and Technology Fellowship Programme – 2010” under Department of Agriculture, Govt. of USA, USA in the area of agricultural biotechnology with respect to “Allergencity assessment of genetically modified foods”. His earlier studies focussed on BMI in human patients with breast cancer and possible correlation with the disease and animal studies to look into effect of type of dietary fat on mammary carcinogenesis. Also, the effect of macro- and micronutrient deficiencies and supplementation were studied in intestinal epithelial cell apoptosis. Further, cisplatin induced apoptotic animal model was developed. Many collaborative research projects are in the field of “Fluorosis”, a major public health problem in India. He is a CPCSEA nominee (under Ministry of Environment and Forest, Govt. of India) and Inspector for various Govt. Organizations and Industry. He is also a trained GLP Assessor working on behalf of National GLP Monitoring Authority of DST, Govt. of India. He is a Life Member of Indian Association of Pathologists and Microbiologists (IAPM-AP), Nutrition Society of India (NSI), Society of Toxicological Pathologists of India (STPI), Laboratory Animal Scientists Association (LASA) and member, Indian Medical Association (IMA). He is on the teaching faculty of courses in Nutrition as well as Laboratory Animals Sciences. Effect of Brassica Nigra on Benzo (a) Pyrene mutagenicity – K. Polasa, P. UDAY KUMAR and K. Krishnaswamy. FOOD CHEMICAL TOXICOLOGY – 32(8), p 777-781, 1994. A comparative clinico-pathological study of oral submucous fibrosis in habitual chewers of panmasala and betelquid – Somababu, R.V. Batt, Putcha Uday Kumar et al – CLINICAL TOXICOLOGY – 34(3), p 317-322, 1996. Changes in blood-brain barrier nutrient transport in the offspring of iodine deficient rats and their preventability – Y. Sunitha, P. Uday Kumar and M. Raghunath. NEUROCHEMICAL RESEARCH – 22(7), p 785-790, 1997. Beneficial effect of tamarind ingestion on fluoride toxicity in dogs – A.L. Khandare, P.Uday Kumar and N. Laxmaiah. FLUORIDE – 33(1), p 33-38, 2000. Nutritional and short term toxicological evaluation of perilla seed oil – T. Longvah, P.Uday Kumar and Y.G. Deosthale. FOOD CHEMISTRY – 70, p 13-16, 2000. Additional beneficial effect of tamarind ingestion over defluoridated water supply to adolescent boys in a fluorotic area – Arijun l. Khandare, Uday kumar P, Rao G. Shanker, K. Venkaiah and N. Lakshmaiah – NUTRITION – 20:433-436, 2004. Effects of vitamin restriction and supplementation on rat intestinal epithelial cell apoptosis – Lakshmi Bodiga vijaya, Boindala Sesikeran, Putcha Udaykumar,Subramaniam Kalyanasundaram, Manchala Raghunath – FREE RADICAL BIOLOGY & MEDICINE 38:1614-1624, 2005. Chronic low intake of protein or vitamins increases the intestinal epithelial cell apoptosis in Wistar/NIN rats – Viajay Lakshmi Bodiga, Sesikeran Boindala, Uday Kumar Putcha, Kalyanasundaram Subramaniam and Raghunath Manchala – NUTRITION (2005) 21:949-960. Beneficial effect of copper supplementation on deposition of fluoride in bone in fluoride and molybdenum - fed rabbits – A.L. Khandare, P. Suresh, P. Uday Kumar, N. Lakshmaiah, N. Manjula, G. Shanker Rao – CALCIF TISSUE INT (2005) 77:233-238. Spontaneous pathological lesions of liver and lungs in pre-clinical toxicology evaluation studies. Syed S.Y.H. Qadri, P.Uday Kumar and B.Sesikeran. INDIAN JOURNAL OF VETERINARY PATHOLOGY 29(2): 102-105, 2005. Effect of micronutrient supplementation on health and nutrition status of school children: Growth and morbidity – K.V. Rameshwar Sarma, P. Uday Kumar, N. Balakrishna et al – NUTRITION (2006) 22: S8-S14. Effect of micronutrient supplementation on health and nutrition status of school children: Biochemical status – Battipolu Sivakumar, K Madhavan Nair, P. Uday Kumar, N. Balakrishna et al – NUTRITION (2006) 22: S15-S25. Chronic low vitamin intake potentiates cisplatin induced intestinal epithelial cell apoptosis in WNIN rats. Bodiga Vijayalakshmi, Boindala Sesikeran, Putcha Uday Kumar, Subramaniam Kalyanasundaram, Manchala Raghunath. World Journal of Gastroenterology (2006), 12 (7): 1078-1085. Do poultry also develop oesophageal tumours in high incidence areas of human oesophageal carcinoma? – Uday Kumar Putcha, Ramesh V. Bhat and Pratap H. Shetty – THE IND. J. NUTR. DIETET. (2006) 43:16-21. Nonclinical toxicology study of recombinant-plasmid DNA anti-rabies vaccines - P. Uday Kumar, B. Dinesh Kumar, V.V. Annapurna, T. Prasanna Krishna, S. Kalyanasundaramj, P. Suresh , N. Harishankar , V. Jagadeesan , S. Hariharan A. Nadamuni Naidu , Kamala Krishnaswamy, P.N. Rangarajan , V.A. Srinivasan ,G.S. Reddy, B. Sesikeran. VACCINE 24 p 2790-2798 2006. Effect of calcium deficiency induced by fluoride intoxication on lipid metabolism in rabbits. Arjun L Khandare, P.Uday Kumar, N. Hari Shankar, S. Kalyanasundaram and G.Shankar Rao. FLUORIDE, 40(3), p184-189, 2007. Effect of turmeric and curcumin on oxidative stress and antioxidant enzymes in streptozotocin induced diabetic rat. P.Suryanarayana, A.Satyanarayana, N.Bala Krishna, P.Uday Kumar, G.Bhanuprakash Reddy. MED. SCI. MONITOR, 13 (12), p286-292, 2007. Nutritional and toxicological evaluation of wheat grown on soils with or without fly ash treatment. Bhaskarachary Kandlakunta, Ramulu Punna, Udayasekhararao Parchuri, Bapurao Sangras, Kamala Krishnaswamy, Syed Qadri, Uday Kumar Putcha and Sesikeran Boindala. J SCI FOOD AGRIC, 89: 384-389, 2009. Immunohistochemical study of aging rat brain – Effect of high aluminium and restricted calcium in diets. Uday Kumar Putcha, Neelam Lekki, Kaladhar Madhavapeddi and Sesikeran Boindala. ANN NATL ACAD MED SCI (India), 45(2): 117-129, 2009. Siripuramparthasaradi, Ramakrishna Rao, Putcha Uday Kumar and Arabinda Chaudhuri. MOLECULAR PHARMACEUTICS, Vol. 6, No.3: 918-927, 2009. Recombinant human epidermal growth factor alleviates gastric antral ulcer induced by naproxen – a non-steroidal anti-inflammatory drug. 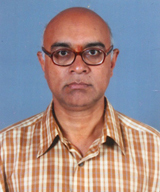 Ashok Raja C, Srinivas V.K, Krishnamohan V, Uday Kumar P., Vijaylakshmi, V. Gastroenterology research, 2010, 3(3), 125-133. Lead and essential trace element levels in school children: A cross-sectional study. Y.Srinivasa Reddy, Raghu Pullakhandam, K.V.Radha Krishna, P.Uday Kumar and B.Dinesh Kumar. Annals of Human Biology, 2010, online: 1-6. Effect of varying doses of cisplatin on rat intestinal apoptosis. Uday Kumar P,Vijayalakshmi B, Kalyanasundaram S, Raghunath M and Sesikeran B. Journal of Laboratory Animal Sciences, vol1, 43 – 48, 2011. Magnesium hydroxide for protection against fluoride toxicity in rabbits. Arjun Khandare, Uday Kumar and Shanker Rao. Fluoride, 44(1): 21-26, 2011. Does maternal undernutrition effect human fetal pancreas morphology in second trimester of pregnancy ? An exploratory study. Uday Kumar Putcha, B.A.Ramalakshmi, T.P.Krishna, K. Venkiah and B.Sesikeran. Abstract in Annals of Nutrition & Metabolism, 55(1),156, 2009. Toxic effects of strontium (with and without fluoride) in guinea pigs). Arjun L. Khandare, Uday Kumar, B.Tulja and Shankar Rao. Workshop on Medical Geology - Health hazards in India with special reference to north eastern states. October 28 & 29, 2010 organized by Geological Survey of India, North Eastern Region, Shillong (Meghalaya). Nutrition and the skin. R. Patnaik, T.N. Choudary, B. Sesikeran, P. Uday Kumar(2008). In IADVL Textbook and Atlas of Dermatology, Vol. II Eds. R.G.Valia and Ameet R. Valia, Third edition. Bhalani Publishing House, India. Importance of pathology in toxicological studies. Qadri, S.S.Y.H., Uday Kumar Pand Sesikeran B. (2009). In Good laboratory practice; Emphasis on medical devices. Eds. P.V.Mohanan and Mahadeva Murty. chapter 11, p.126-130. SCTIMST.India. Risk of aluminium toxicity in the Indian context - Neelam, P. Uday Kumar and M. Kaladhar. ICMR BULLETIN – 29(8), 1999. Nucleolar organizer regions (NORs) in oral mucosal biopsies – P. Uday Kumar, B. Sesikeran, Nagalaxmi and K. Ramachndra Reddy - AMALA RESEARCHBULLETIN – 20, p 100-103, 2000. Fluoride toxicity and dietary intervention – A.L. Khandare, P. Uday Kumar and N. Laxmaiah – NUTRITION NEWS – 22(1), 2001.